This family has no specific place to be until Saturday morning! Ok, Tink and Bear do have to go to school, but for the first time in FOREVER we do not have a meeting, practice, game, or appointment on the calendar. So happy I can say that. We have been running crazy with both girls in soccer and Tink in the middle of volleyball season. 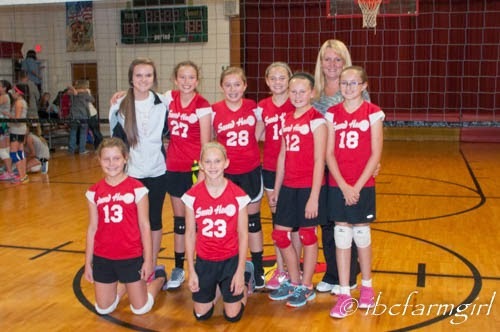 I don't usually do this, but I have to brag a bit on these volleyball girls. 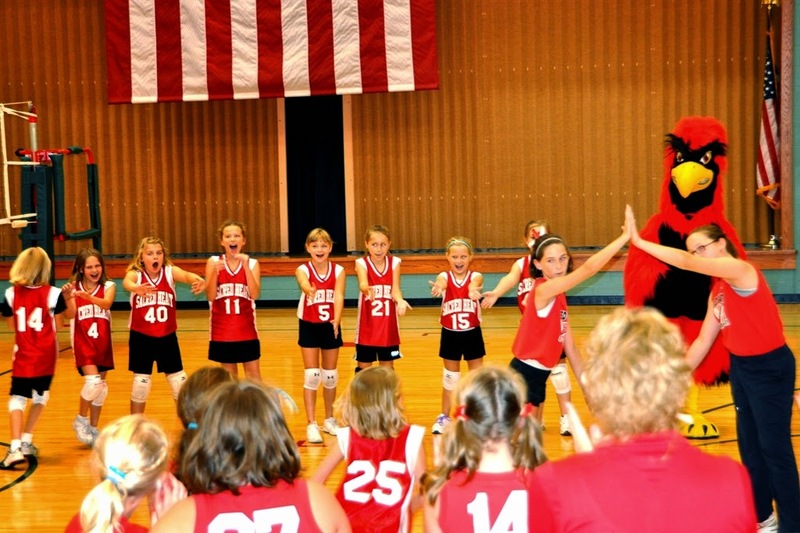 Here they are four years ago playing "up" to help fill the 5th and 6th grade teams. They were third graders in this picture! And here they are today, playing other teams their very own age for the first time as true sixth graders! So far they are undefeated, and they have played through their schedule once. That means we start playing teams we have already played this year. I can't begin to tell you how much fun it is to watch these young ladies play. They rarely take themselves seriously, there are always more smiles that frowns, and they have each other's back. Geez, I'm getting teary just chatting about them. 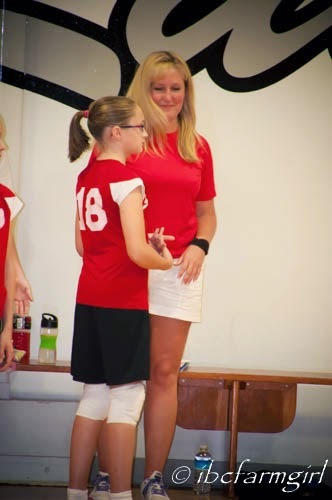 A big part of their success is their coach, Kristin. She is able to get the absolute best out of these girls with positive encouragement and lots of giggles. One of the best things about our beloved little school is the community/family created. These girls will go off to the Jr./Sr. high school next year. They will never be a class of 12 again. They probably will never even be in a classroom with just twelve students. No matter which way they go in the next six years, they will always have this core group of friends to fall back to and count on. Yikes! I had better not get out the caps and gowns, or I will really tear up! Nope...we have a season of volleyball to finish, and a season of basketball to enjoy before we have to think about seventh grade and all that brings with it. Yesterday was a work of chaotic organization. Meetings started at 2:00 and I was home by 4. Tink stayed after school for volleyball practice, and Bear came home on the bus. At 5 I went to pick up Tink, at 6 Tall Guy had Bear at soccer practice, and we all met up at the Farm Bureau office for our monthly county board meeting. Somewhere in there everyone was at least presented with food for supper. Whew! So I will be thankful for this wonderful lull in the action around here because harvest is not too far away. Hope you and your family are enjoying these wonderful, cool days we have been blessed with. Thanks for your comment Leslie. These years are going by so quickly. 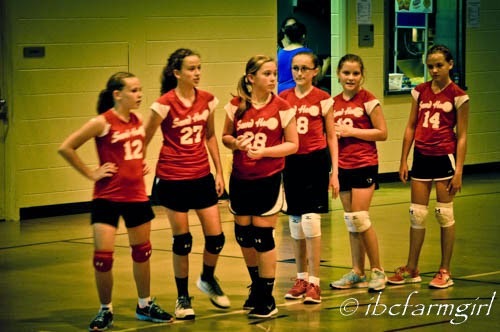 I'm so glad when our kids can join a team sport and have fun. That isn't always the case! Keep on smiling! Good for you! We are utterly overwhelmed with sports and school schedules lately. Michelle, we have to recharge because it looks like there will be THREE volleyball games next week. Thankfully, they are all within about a 6 mile range of our house. No trip to the the big metropolis of Lafayette for us! Whew! These years fly past, don't they! I can't believe how fast your girls are growing up! Savor every moment.